CityU is a private nonprofit university accredited at the undergraduate, graduate and doctoral level. CityU is dedicated to serving working adults and transfer students, and is ranked by U.S. News & World Report among the top 30 for online bachelor degree programs, and among the top 20 online programs for veterans in the U.S. CityU is comprised of three schools and two divisions that offer flexible online, onsite, and performance-based programs. Aside from its flagship campus and headquarters in Seattle, Washington, CityU offers more than 60 degrees and certificates at 28 locations around the world. CityU’s curriculum is informed and taught by professionals who are leaders in their field and category, and is considered to be a top producer of teachers, counselors and MBAs in the state of Washington. To learn more about CityU and its programs, please email us. City University of Seattle serves thousands of students around the world in Asia, Europe and North America. To learn more about CityU view these fast facts. City University of Seattle offers instruction worldwide, so it is imperative that the University’s message and identity standards are observed. Consistent application of these standards over time will benefit City University of Seattle through improved awareness, recognition and professional appearance. 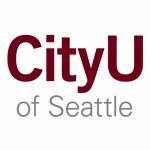 Please review the Identity Standards document carefully before using the City University of Seattle logo, slogan, seal, or any other identifying symbol. Permissions and questions about use and policies should be directed to CityU Marketing. Find CityU’s Identity and Logo guidelines in the Identity Standards (PDF) document, and the downloadable logos below. Cities and Countries Outside U.S. Location specific logos are available in black & white, and 2 color (red, gray) format. Select your location to download a zip package that contains the following file formats in both low and high resolutions: JPG, GIF, TIF, PNG, EPS. Both horizontal and vertical logos are enclosed in the zip file.